[154 Pages Report] The locomotive market for power conversion systems is primarily driven by for expansion of rail network infrastructure, increasing urbanization and environmental sustainability. With growth in urbanization and industrialization, there is going to be a substantial increase in the demand for power and related conversion systems during the forecast period. The research methodology used in the report involves various secondary sources such as Union of European Railway Industries (UNIFE), Brazilian Association of Railroad Suppliers (ABIFER), International Railway Journal (IRJ), amongst others. The market numbers are based on country-wise production of rolling stock, which is further added to arrive at the regional market. This regional data is added to derive global data. The production of rolling stock has been considered, to arrive at the market size, in terms of volume. This country-wise market size, by volume is then multiplied with the country-wise average OE price of each type of power conversion component. This results in the country-wise market size for that particular power conversion component, in terms of value. The same approach has been used to calculate the market sizes of the technology. The summation of the country-wise and regional-level market size, in terms of value, provides the global locomotive market for power conversion system size. The locomotive market for power conversion system ecosystem consists of traction motor manufacturers such as Hitachi Ltd (Japan), CRRC Corporation Limited (China) and, AEG Power Solutions (Germany) amongst others; Auxiliary power unit manufacturers such as Turbo Power Systems (U.K.), Alstom S.A (France) and Toshiba Corporation (Japan) among others and converter manufacturers like Strukton (The Netherlands) and Siemens AG (Germany) amongst others. These OEMs integrate these components and sell them to end users to cater to their requirements. The locomotive market for power conversion systems is projected to grow at a CAGR of 2.92% during the forecast period, to reach a market size of USD 4.27 Billion by 2021. A wide array of upcoming rail projects, increased urbanization, and the rising demand for public transport has led to an increase in demand for locomotives and their related power conversion systems. Additionally technological advancements, such as the introduction of IGBT module, SiC module, and auxiliary power units have led to a rising demand for power conversion components. These advancements have increased the fuel-efficiency, lowered the emission levels, reduced the overall weight and have resulted in reduction of power loss while switching the state of current. In this report, the locomotive market for power conversion systems is broadly segmented based on power conversion components into power converters (rectifier and inverter), traction motors, alternators and auxiliary power conversion units. The traction motors segment accounted for the largest market size in the locomotive market for power conversion systems, as this component assists in improving the efficiency by reducing losses, which can be categorized into iron losses, copper losses, mechanical losses, and harmonic losses. The Electric Multiple Unit (EMU) is estimated to account for the largest share of the locomotive market for power conversion systems in 2016. The locomotive market for power conversion systems for EMU (Electric Multiple Unit) is estimated to be the fastest growing segment during the forecast period. 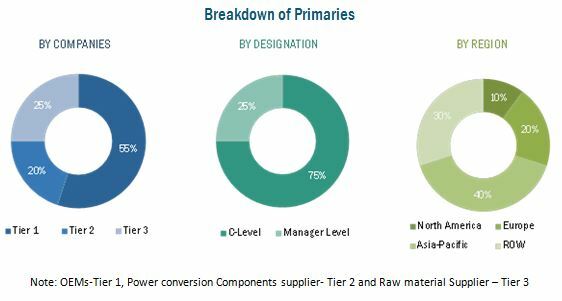 The Asia-Pacific region is estimated to dominate the power conversion system market. This growth can be credited to the improving socio-economic conditions in emerging economies such as China, India, and Japan. The sizeable populations in these countries have resulted in an increased number of government projects such as extension of rail routes, increase in production of rolling stock, advanced rail infrastructure, and the replacement of power conversion systems for better efficiency. The power conversion system market, by technology, is led by the IGBT module. The high demand for this module is credited to the advantages it offers, such as its reduced weight and lesser power loss while switching the current from AC to DC and vice-versa. Key factors restraining the growth of the power conversion system market include the high cost of the components and its complex nature. 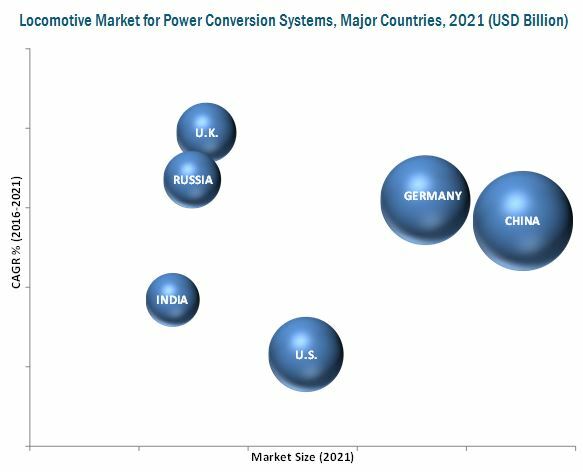 The locomotive market for power conversion systems is dominated by a few global players such as Hitachi Ltd. (Japan), CRRC Corporation Limited (China), Bombardier Inc. (Canada), Alstom S.A. (France) and ABB (Switzerland). For instance, Hitachi Ltd. has strong product offering and they have invested heavily in R&D to retain their market position. They have adopted new product development and supply contracts as their key strategy while CRRC Corporation Limited has recently emerged by collaborating with the subsidiaries. They have adopted new product development and mergers as their key strategy to emerge as the leading player in the market.